Sometimes it helps to employ unconventional perspectives when thinking about the size of things. So here’s a pretty awesome map from American Enterprise Institute’s Mark Perry that shows how massive and productive America’s $18 trillion economy really is on a global scale. The map compares the gross domestic product of each US states with the national GDPs of other nations. America’s largest state economy is California. 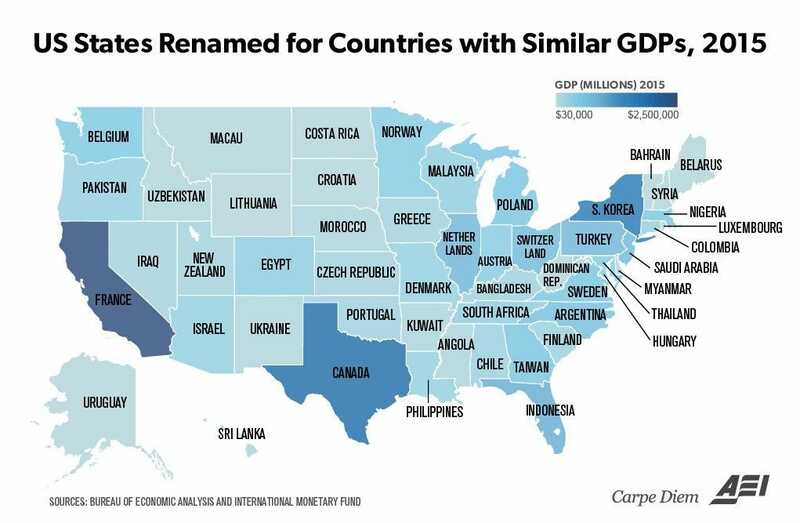 For 2015, the Golden State’s GDP was about $2.46 trillion, slightly above France’s GDP ($2.422 trillion). But France’s population is about 66.48 million, while California’s is only about 39.14 million – meaning California produces about the same as France with about 40% fewer people. 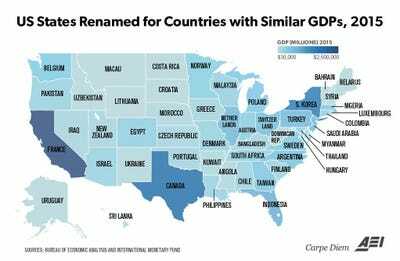 To put it in a global perspective, if California were its own country in 2013, it would have been the 6th-biggest economy in the world — right behind the UK whose GDP was $2.85 trillion.